Temple B'nai Sholom v. City of Huntsville. The Becket Fund for Religious Liberty (n.d.). Retrieved from https://www.becketlaw.org/case/temple-bnai-sholom-v-city-huntsville/. Temple B'nai Sholom v. City of Huntsville. (Apr. 04, 2019). https://www.becketlaw.org/case/temple-bnai-sholom-v-city-huntsville/. "Temple B'nai Sholom v. City of Huntsville." The Becket Fund for Religious Liberty. Accessed [Apr. 04, 2019]. https://www.becketlaw.org/case/temple-bnai-sholom-v-city-huntsville/. Temple B’nai Sholom is a Reform Jewish synagogue with a long history in Huntsville, Alabama. Founded in 1876, it has occupied its present location since 1899. The Temple sanctuary has been designated a Historic Building, and was extensively renovated in the mid-1990s. In the 1970s, the Temple purchased two adjacent pieces of property in order to have room for future expansion. Each parcel contained a house, neither of which were of historic significance, although the entire area lies within an historic preservation district. One of the houses was demolished many years ago without any objection from the city or the Historic Preservation Commission, and other property owners in the area, including several nearby churches, have been allowed to demolish similar buildings. On September 15, 2000, city code enforcement officials issued a notice declaring the house at 406 Clinton Avenue unsafe, and ordering the Temple to either “repair or demolish” the structure. Since the Temple intends to use the site for religious activities, including eventual expansion of the sanctuary, it sought permission of the Huntsville Historic Preservation Commission to demolish the house. Finally, on May 8, 2001, Temple B’nai Sholom filed suit in Madison County Circuit Court against the City of Huntsville, the head of the city’s Inspection Department, and the administrator of the city’s Historic Preservation Commission. 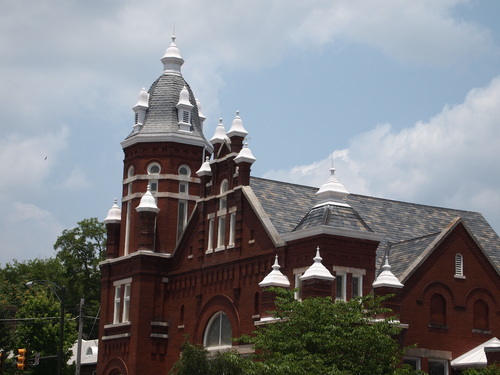 On June 1, 2001, defendants moved to remove the case from county court and move it instead to U.S. District Court for the Northern District of Alabama.